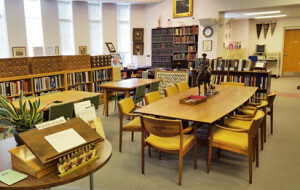 The Pennsylvania Room is an expansive history and genealogy collection with a Fayette County focus. Every year, hundreds of family historians stop by to learn about their local heritage. Others use our variety of resources—including books, county records, and microfilmed newspapers—to research events as distant as the French and Indian War or as recent as a local high school basketball game. We are committed to not only recording the history of Fayette County and its people, but also to helping our visitors access and explore that history. All of the major County Histories, in addition to town histories like James Hadden’s History of Uniontown. A wide selection of early County Records on Microfilm, including births, deaths, marriages, wills, tax records, deeds, mortgages, and census records from 1790 to 1940. Local Newspapers on microfilm from 1805 to the present and Uniontown City Directories dating to 1903. An Obituary Index that covers deaths reported in Uniontown’s newspapers. Cemetery Transcription Books and records from some local funeral homes. Many books and binders regarding individual Family Histories, in addition to hundreds of Family Vertical Files that contain miscellaneous research donated by visitors. More than 500 Yearbooks from Fayette County schools dating to 1910. A significant number of Subject Folders on topics of historical interest, from the National Road to the Glass Industry to the Robena Mine Disaster. A collection of Maps and Atlases that includes warrantee maps, atlases of early Fayette County property owners, Sanborn Fire Insurance maps for Uniontown, and many others. The Pennsylvania Archives Series and thousands of other books on state and local history. Subjects include church histories, coal mining, military records, transportation, architecture, and the writings of local authors.